Editor’s Note: This article is the first in a series of three, with similar articles on CR and portable systems available in the coming months. This installment focuses on DR products and trends. Whether an ordering physician seeks to confirm a suspected wrist fracture or starts with a chest X-ray to assess what other imaging might help solve a diagnostic question, plain radiography exams comprise 60% to 70% of a hospital imaging department’s exams, according to most estimates. Providing quality, cost-effective images with efficient workflow and minimized radiation dose are the objectives of those exams. Increasingly, that means direct digital radiography (DR). The benefits of digital vs. film-based radiography have been established. And as the cost of DR becomes increasingly competitive with computed radiography (CR)—single-plate DR systems can be purchased for less than multiplate CR systems—the potential workflow advantages and new applications of DR systems make economic sense for more facilities. As Kirk Ising, strategic operations director at KLAS Research, describes it, DR used to be a “nice-to-have” purchase. Ising was part of the KLAS team that reported on the DR market last year in Digital X-Ray 2011: An Untethered Market. He says that in years past, radiology departments frequently had the mindset that they could “save money and do fine with CR.” As the cost difference lessens, more imaging facilities and departments see DR as the way to provide radiography services. Through faster imaging processing times and automation, DR systems enable technologists to perform exams more efficiently than using CR or film. The increased focus on dose measurement and reduction makes DR desirable because the systems can acquire images with less radiation exposure to the patient, and the image processing technology also allows users to adjust and manipulate images electronically to avoid retakes and additional exposure. • What combination and quantity of fixed, tethered, and wireless detectors make sense for my department? • Does it make sense to retrofit an existing analog room or are new tables, wall stands, and tubes the better choice? • Am I looking to utilize the latest DR applications and automation or just replicate my existing services with DR? It’s important to consider what makes sense both economically and clinically. Budgets remain tight in imaging organizations, which is reflected in the faster growth of retrofitting DR detectors on analog equipment rather than installing full DR systems. Ising notes that the retrofit systems offer imaging organizations entry into DR capability at a significantly lower price point than purchasing a full system. For example, if a hospital has radiography suites that are five years into an expected 10- or 15-year life span, it can upgrade to DR without losing its full investment in the existing rooms. Carestream and its acquired affiliate, Quantum Medical Imaging, along with Canon, GE Healthcare, and Fujifilm, offer retrofit/upgrade systems that were ranked among the top eight in the category in the 2011 KLAS survey. Some vendors offer retrofit systems that fit many existing systems; others offer only an upgrade path from their own systems to DR. In addition to the capability to retrofit or upgrade systems, wireless detectors offer some clinical and economic flexibility. For example, a two-detector room may maximize throughput, but the ability to utilize one detector in that room and use the other for portable imaging needs permits the same equipment to be used in multiple settings as well as allowing all X-rays the facility takes to be captured using the same technology. Depending on a facility’s volume, DR may help the imaging department manage its radiography needs with fewer rooms or detectors. For example, Canon offers retrofit upgrades for existing portable systems, such as GE Healthcare’s popular AMX-4 and Definium portables. The upgrade can have the user up and running in half a day, according to Anne Ji, product manager for Canon. Across the DR space, Ji says approximately one-half of Canon’s sales are retrofit or upgrades and one-half are new systems. “It’s about finding the solution and configuration that fits the facility the best way,” she says. If an existing radiology room needs to be replaced or a facility is looking to outfit a newly built radiography room, numerous vendors offer ceiling- and floor-mounted systems with tables and wall stands as well as single- or dual-detector systems. Those detectors may be wireless or tethered. Other options involve heavy-duty tables for bariatric cases and more adjustable tables to ease access for geriatric patients. Replicating existing radiography services with a DR system is one thing, but deciding whether to acquire the expanded capabilities DR systems can offer adds another layer to a purchasing decision. Dave Widmann, general manager of GE Healthcare’s diagnostic X-ray division, says organizations purchasing equipment today should consider what he terms “future flexible systems” so they can take advantage of current and anticipated change rather than just replicate the capabilities of an analog or CR system with DR technology. Toward that end, GE’s Discovery XR656 offers new capabilities, including dual-energy subtraction to digitally remove bones or soft tissue from an image, to view some overlying structures, perform largely automated image stitching, and create tomosynthesis images that allow for the reconstruction of an X-ray data set to produce coronal images of an area of interest. In addition to new capabilities, many systems are increasingly automated to improve throughput and to allow the radiologic technologist to spend more time with the patient than at a control panel in the next room. For example, Toshiba’s ceiling-mounted RADREX-i system includes a display on the overhead tube so the technologist can immediately review the image from tableside, allowing the technologist to spend more time with the patient. “The technologist can accept or reject the exam at the point of care, which allows productivity and more time with patient,” says Aaron Ybarra, product manager for Toshiba’s X-ray line. Siemens’ flagship radiography Ysio (pronounced easy-oh) system offers its own version of a color touch screen on a tube-mounted control panel over patients so the technologist only has to step away from the table to take the exposure, according to Viola Fernandes, radiography product manager at Siemens. Ysio also comes standard with automated longitudinal and rotational tracking standard to ensure uniform source-image detector distance. Others systems offer their own versions of automated tracking to increase exam quality and efficiency. Toshiba’s software helps speed patients through the department efficiently and accurately by pulling exam data from the RIS and automapping certain exams, including X-rays of the chest, abdomen, and elbow. The software estimates appropriate settings and views so the technologist only has to review and confirm the exam settings rather than input them manually. Another factor helping advance the adoption of DR is customers’ expanding efforts to reduce and monitor dose exposure. Dose measurement and reduction have been hot topics outside the imaging community in recent years. The broader healthcare community, the general public, and government have become increasingly aware of radiation exposure issues. As of July 1, California law requires dose reporting for CT exams. Radiography system customers are expressing the desire to minimize, measure, and record dose information, according to several vendors interviewed for this article. “Our products are being challenged to new levels of patients safety and dose efficiency,” says Rob Fabrizio, director of marketing and development for Fujifilm’s digital X-ray product line. Fabrizio notes that Fujifilm’s newest FDR D-EVO detector can help imagers reduce radiation exposure 40% to 70% below levels associated with CR and 20% lower than some DR systems. He says potential customers are increasingly demanding side-by-side demos and asking vendors to show how their systems will lower dose in their hospitals. Ybarra adds that he sees exposure concerns manifest in potential customers wanting to know how a given radiography system will help the department record and manage exposure as part of quality assurance efforts. He says Toshiba offers DICOM-compliant structured dose reporting so facilities can gather and monitor exposure. Widmann notes that affordability and value are the prime drivers in the current imaging economy, but dose management is clearly on the minds of potential customers. Fabrizio expresses a similar view as Whitman, citing cost and value, dose, and patient throughput as the primary prepurchase requirements for DR products—supported by quality customer service and support. Imaging system customers have multiple options to meet virtually every general radiography need, as illustrated in the vendor descriptions systems below. And this article does not even address the combined X-ray/fluoroscopy systems available on the market. Making a good purchase may hinge on identifying your answers to the considerations mentioned in this article and investigating how they match up to the various provider offerings. • Canon: With its RadPRO FM, URS, and Elite systems, Canon offers three versions of general DR systems that can be configured in floor-mounted or overhead systems. Canon also offers a wide array of wireless, fixed, and corded digital detectors. Ji says Canon’s installations appear to be evenly split between new systems and upgrades/retrofits. One popular upgrade is for GE’s popular AMX-4 portable radiography systems. Ji says the multiple offerings help serve customers who realize it’s time to go digital—or that CR didn’t bring the anticipated workflow benefits—but have very different needs in their radiography departments. • Carestream Health: The company’s DRX-1 wireless detector launched the wireless detector trend and introduced the idea of retrofitting analog systems with DR detectors. The DRX-1 was ranked third in the 2011 KLAS report. The DRX-Evolution is a ceiling-mounted room designed for the DRX detector. Carestream also offers its floor-mounted DRX-Ascend system, which also utilizes the DRX detector. The DRX-Ascend components come from Carestream’s purchase of Quantum in 2010. It operates Quantum as a subsidiary, and the Q-Rad system remains available through distributors. Carestream offers six different versions and sizes of its detectors for different customer uses. “We want to offer a variety of solutions so we’re not forcing a system where it’s not warranted,” Titus says. • GE Healthcare: The Discovery XR656 is GE’s Healthcare’s flagship general radiography system. 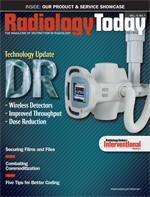 The ceiling-mounted system offers new radiography capabilities, including dual-energy imaging. It also features GE’s new FlashPad wireless digital detectors. The Brivo XR385 is a floor-mounted general radiography system designed to bring DR benefits to general X-ray procedures. GE will also upgrade its Proteus XR/a analog systems with its DR Imaging Option that incorporates the new FlashPad detector. • Konica Minolta: New to the DR market, Konica Minolta’s AeroDR wireless detector was approved this past February, and thus it was not rated in the last KLAS report. The manufacturer offers 14- X 17-inch and 17- X 17-inch detectors that can upgrade bucky systems and an upgrade kit for portable X-ray systems. The AeroDR X70 system is Konica Minolta’s X-ray suite offering, which includes a ceiling-mounted tube and collimator, table, and wall stand for the AeroDR detector. Konica also offers its Xpress DR ceiling-mounted system with table and wall stand. The system has a fixed17- X 17-inch amorphous silicone detector in the wall stand and a tethered 14- X 17-inch for the table bucky. Konica Minolta’s Flex DR system used a tethered cesium iodide detector. • Philips Healthcare: Philips focuses on its high-end DigitalDiagnost 3.0 radiography rooms, seeking to couple automation and high throughput with top-quality images. Philips uses the Trixell detector, which it developed in a joint venture with Siemens and Thales. The Trixell detector also can be used to upgrade Philips’ BuckyDiagnost analog systems and is available on its MobileDiagnost wDR portable system. While its traditional focus is the high-end radiography system, the company is also responding to the popularity of the retrofit systems and wants to bring premium quality radiography to facilities without the budget for a high-end system. • Toshiba: The company offers two basic general radiography systems with several different configurations. RADREX-i is a ceiling-mounted system designed for high-volume radiography rooms. The system uses a Varian detector. The T.RAD Plus offers analog ceiling- and floor-mounted configurations with tables and wall stands that can be upgraded to DR with Carestream detectors. Toshiba works with its analog customers to make the digital upgrade, according to Ybarra, but does not yet offer its own wireless detector and thus is not in the retrofit business like Carestream and Canon. • Siemens Healthcare: Siemens offers two general radiography DR systems. Its AXIOM Multix M system was rated fourth in its category in the most recent KLAS rankings. Multix M uses a tethered flat-panel Gaddox detector made by Canon. It’s a one-detector system that can be configured with a ceiling- or floor-mounted tube, with table-mounted and vertical buckys available, according to Fernandes. Ysio is a highly flexible ceiling-mounted digital radiography solution available in a variety of combinations: as a wall stand with an integrated detector; a wall and table system with a wireless detector; or as a mixed detector solution. Ysio uses a cesium iodide scintillator flat-panel detector for low-dose and high-resolution images. Siemens’ wi-D detector has a unique charging mechanism ensuring that the detector is always charged when placed in the table or wall detector trays. Siemens’ new Ysio system was too new to be scored in the 2011 KLAS report. The Multix M can be seen as an entry-level DR system, and the Ysio is the top-of-the-line system. Hospital customers choose between the systems by balancing cost, throughput needs, and the range of exams they perform, according to Fernandes. • Shimadzu: The company’s RADspeed general X-ray system was ranked No. 1 in the most recent KLAS ranking, receiving high marks for speed and dependability. The system can be purchased with Shimadzu’s new Safire flat-panel detector or with Canon’s family of flat-panel detectors. RADspeed variations include both ceiling- and floor-mounted tube systems with both table and vertical bucky stands. Outside of the general radiography room setup, Shimadzu also offers a mobile system and a combination radiography/fluoroscopy system.